La Bella Lingua: My Love Affair with Italian, the World’s Most Enchanting Language attracted readers around the world, earned for me the great honor of being knighted by the President of Italy, and garnered a spot on the New York Times best-seller list and as the subject of a Times acrostic. The companion blog that I created—”Becoming Italian Word by Word”—also took on a life of its own, attracting almost two million visitors and winning a “blogger of the year” award for “Best Arts and Cultural Blog” from Italy magazine. Over the last decade readers have come from just about every country — Italy, England, Ireland, Poland, China, India, Japan, Australia, Samoa, Russia, Morocco, Germany, Brazil, Chile. A woman on a ranch in South Africa wrote to say my blog had inspired a series of paintings of Italian gardens. A group of nuns doing missionary work followed it regularly. Many teachers used the blog to spark conversation in class. One woman translated and read each post to her blind elderly brother, who had been born in Naples. To all my readers and followers, grazie di cuore. I thank you from my heart. But after a decade of focusing on words and expressions in la bella lingua, I am changing gears. As of the end of April, I will not be posting at “Becoming Italian Word by Word.” Instead, I am debuting a new blog, “A Passion for Italy,” which will be available on my website, along with a complete archive of my previous posts. To subscribe, go to the top of the sidebar on my blog page. If you are already subscribed via e-mail to my Typepad blog, your subscription will automatically transfer to the new blog. However, if you subscribed via RSS, you will need to do so again, using the same link as above. My new blog will go beyond the pages of LA PASSIONE: How Italy Seduced the World to present more interviews with passionate Italians and more descriptions as well as photographs of the people I met and the places I visited. 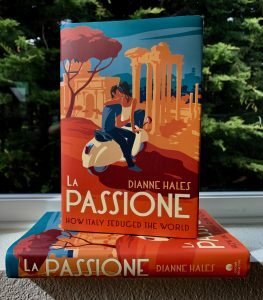 I am excited about sharing the back stories of my research with you, and I hope you enjoy discovering more about the Italian passions that seduced the world.